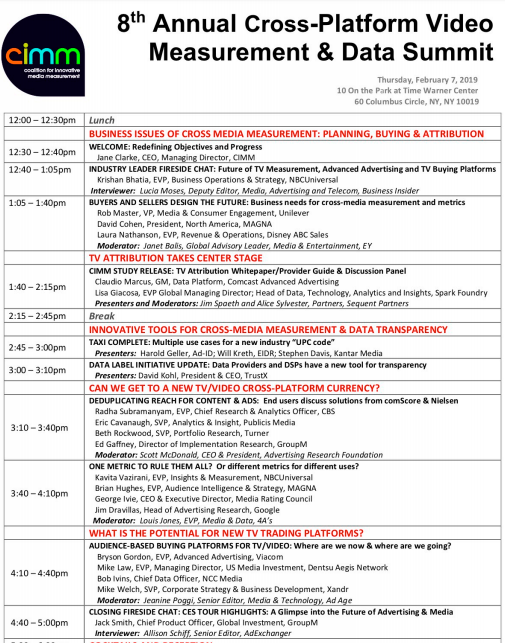 The Summit organized by CIMM (Coalition for Innovative Media Measurement) in New York City Thursday delivered an array of insights focused on key TV/video cross-platform measurement issues impacting planning, buying and attribution. Always stimulating, this year’s summit delivered advanced insights while attempting to address some very long-standing measurement dilemmas. Perhaps the star of the summit was the comprehensive overview of television attribution developed by Sequent Partners for CIMM by Sequent Partners’ Jim Spaeth and Alice Sylvester, which helps demystify this complex arena. Lisa Giacosa, executive vice president-global managing director at Publicis’ Spark Foundry and Claudio Marcus, general manager of data platform at Comcast’s FreeWheel, also emphasized the importance of creative and context and the influence of the many marketing levers that can enhance the TV ad effects on a brand. But Spaeth noted that the purchase propensity, which pre-exists for brands, is rarely accounted for and as importantly is part of a brand’s base equity. Under the heading, “One Metric to Rule them All,” Magna Executive Vice President-Audience Intelligence & Strategy Brian Hughes reminded the audience that the Association of National Advertisers has called for exact commercial minute measurement. Noting that Nielsen ratings have been built on minute-by-minute data, he stated, “therefore it follows” that this objective could be easily achieved. Panelists appeared to agree on the need to unify and harmonize impressions, but cautioned on counting impressions, however, versus the value of those impressions. Google’s Sheryl Feldinger underlined the importance of “including viewing across all platforms,” which raised questions about the measurement required to produce viewing (exposure) versus audience impressions (opportunity-to-see), as they are very different. George Ivie, Executive Director and CEO of the Media Rating Council (MRC), reminded the audience that the MRC’s standards regarding cross-media measurement, which have been painstakingly developed by a working committee and the MRC staff, is now ready for public comment prior to being published. He noted that, as part of this extensive document duration weighting of impressions, accounting for “relative value” are part of the standards. The importance that audio is delivered as part of the TV/video impression was emphasized by Kavita Vazirani, executive vice president-insights & measurement at NBCUniversal. He also reminded attendees that certain products do better within certain program content, which underlined the importance of metrics for both content and advertising. Noting that Nielsen’s C1, C3 and C7 TV “currencies” have been around since 2006-07, he pointed out that switching currencies is massively expensive to all parties involved, but that the impressions underpinning any currencies must be comparable across platforms. That the industry is still wrestling with this issue is surely disappointing. CIMM, now a subsidiary of the Advertising Research Foundation (ARF), has an aggressive agenda to continue addressing fundamental media measurement issues during the coming year. Thursday’s summit reminds the industry that some of the issues are leading edge, while some are, quite frankly, old chestnuts. However, solutions for both have become ever more difficult to solve in our rapidly changing and ever more complex data and digital video worlds. The Presentations and recording available at www.cimm-us,org.